Darius McCaskey’s review of The Emperor Gaius (Caligula). Darius McCaskey's Reviews > The Emperor Gaius (Caligula). 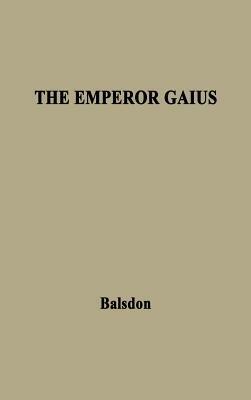 John P. V. D. Balsdon wrote his comprehensive biography of Emperor Gaius in 1934. As a fellow at Exeter College of Oxford University, Professor Balsdon's book is intended for a scholarly audience. While the thoroughness of the research is impressive, the book is definitely geared toward fellow scholars. Without a mastery of Latin and Ancient Greek, several passages are unintelligible. Mr. Balsdon presents several ideas in the original Latin or Greek and provides no explanation of what they mean. He expects his readers to be familiar with ancient concepts already. Further, due to the age of the work and its British origin, some of the language used is unfamiliar to modern American readers. Likewise, some of the grammar and punctuation is not in line with common usage now. Compounding the language barriers is the awkward organization of Professor Baldson's treatise. The biography begins with Emperor Gaius's predecessor, Tiberius. Balsdon intersperses his discussion of Emperor Tiberius with the story of Gaius's childhood. In that discussion, Gaius's father, Germanicus, is also covered. From this opening chapter, the biography moves into the first three years of Gaius's reign as emperor. After covering the first three years, Professor Balsdon narrows the book's focus to the young emperor's activities in Germany and Gaul. His campaign against the barbarians is discussed in some detail. The next chapter details the many conspiracies against Gaius (some real, some imagined), his eventual assassination, and the ascension of his uncle to the head of the empire. Inexplicably, the next chapter of Balsdon's biography is devoted to Gaius's treatment of the Jewish population in Judea and of the Diaspora. Rounding out the book are two general assessment chapters. The first focuses on the emperor's government and administrative skills: the last on his character. Despite these substantial shortcomings to the average reader, Professor Balsdon's book has a few notable bright spots. First is a fold-out family tree, showing the complex branches of the Julio-Claudian line. Second is a detailed time line of the major events of Emperor Caligula's life. The biography also contains a fourteen-and-a-half page index: quite thorough, even for a scholarly work. The three appendices expand or clarify information presented in the text proper. Appendix C, in particular, carries a comprehensive discussion of the primary and secondary sources of information on Gaius's life. In all, Professor Balsdon presents a clear, objective, scholarly assessment of Caligula's birth, life, and death. Some questions about Gaius will remain shrouded by time, but for those who think they know the story of Caligula, Balsdon's biography answers many previously unknown questions and dispels many of the more outlandish rumors perpetrated by his detractors. For the serious scholar, Professor Balsdon provides an intense examination. For the casual reader, however, the biography may be difficult to comprehend. Sign into Goodreads to see if any of your friends have read The Emperor Gaius (Caligula)..